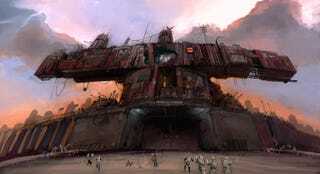 This is a drydock in HullBreach, a complete conversion for the Half-Life 2 video game. The team has an ambitious goal of creating 100% new content for the game, and they've been hard at work on it for several years. The game is set 2,000 years in our future, and involves a bloody world war that threatens to engulf the planet. So the upshot is, even 2,000 years from now, we won't be getting along. According to the developers, the game is "realism-based. So no swooshy laser weapons or impossible Star Trek/Star Wars science. We're keeping it gritty, intense and war-like. So it's a bit like Halo, if we'd never gone to war with the Covenant and instead just started fighting with each other. You can check out more concept art, see the futuristic weapon designs, and even listen to the theme song they've composed for the game at their MySpace page. They have over 20 people working on this thing (supposedly), and it's almost been three years since they began working on it, so hopefully we'll start seeing more soon.